Hello Chris! Greetings from Finland and thanks for taking the time to answer some questions for skullbanger.net. I guess most people know you from your band Alestorm and your epic Bermuda shorts but today we are here to talk about your other project, GloryHammer and your epic new album, ‘Tales from Kingdom of Fife!’. This is your chance Chris, plug your album dude…tell us about it and how it came to be. Be shameless! Chris: Well it was an idea I had had for some time and I got a bunch of guys I knew and one random Swiss guy and after many Terrible things we all got it together and here we are! So the new album is a concept album and has the standard fantasy stuff, wizards, warriors…and umm Unicorns. Obviously there is humor involved and you play it straight faced but you also play it very well and make the album enjoyable as a whole. So can you tell us about how you came up with story? Was it just you or did some of the other band members help out? I know each member represents a character as well? You for example are the evil wizard Zargothrax…tell me Zargs…Let’s Dungeons and Dragons it up, what’s your favorite spell? How many Hit points do you have? I may have just exposed your D&D side to the internet? Chris: Well the idea was mine in what I wanted the story to be and I wanted to take Scotland and have some very Epic power metal history added to land. And Yes each member represents a character in the story and I am the evil wizard Zargothax! My favorite spell would be a magic Missle! But he is a frail guy I would probably only have 3 or 4 Hit Dice. I would like to talk about Tom your singer. I thought he sounded great and has a very strong voice. Where did you find him at? I understand he auditioned to sing for Dragonforce? I have to admit, after listening to the new album it pretty over the top even for power metal but also it’s such a good album. So let’s talk a bit about some song titles here. We have ‘The Unicorn Invasion of Dundee’. Tell me, when did Unicorns become an epidemic. Have Unicorns always been so aggressive? Also, we have the song ‘The Epic Rage of Furious Thunder’…when has Thunder never been furious? Chris: Well there is this power metal band called ‘Rhapsody’ and all their song titles have words like EPIC, RAGE and other types of similar words so I wanted to title a song that I could fit in all the words I could into one title and make it as EPIC as possible! Ok a big question here. What can you tell us about touring? What’s the plans? Finland in the works? I have actually been in contact with the promoter here in Kuopio for Kuopio Rock to try and get you here. Tom said he was interested in coming here when I mentioned it to him. So we need you to rock it out for us here man. I can provide contact info to them if you need. Chris: Well we are wanting to play as many European Festivals as possible and also some shows where we may only draw a smaller crowd but if we can play them that’s great. We just want to blow the people away with our epic POWER METAL! And yes Kuopio Rock would be fantastic to play! Ok Chris, I’m going to start throwing some questions out here, I’m spitballing here and just going to see what sticks…you just…answer away. Ok I am originally from Tennessee a place called Jamestown. Appalachian area. We are home to America’s World War I hero Alvin C. York who was a sharpshooter and mountain man huntsman. Now, Jamestown has a lot of Irish Scottish descendants there…well maybe mostly Irish…but still close to Scotland…so after Dundee got invaded by Unicorns what type of invasion force would Invade Jamestown? Also, our War Hero Alvin York…what type of epic mount would you give him to ride to help fend off this invasion? They made a movie About Alvin York in the 1930’s I can see a new alternate timeline movie featuring this. Chris: Let’s see…I would say manitcores. I could see them roaming the hills of Tennessee and Alvin York would be riding a epic chariot pulled by two flaming horses! Let’s talk about Elvis. Another big thing in Tennessee. 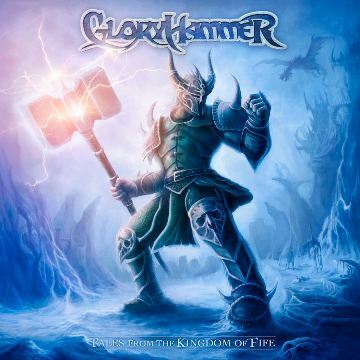 If GloryHammer were to cover an Elvis song power metal style…what song would it be. Would Elvis have magic? Chris: Hmmmm….Blue Suede Shoes of Speed +1!!!! Let’s talk side merchandise. I see a lot of bands trying to increase their revenue stream and have began releasing products with their band name on it. Motorhead has Motorheadphones and Motorhead Lager. Iron Maiden now has a beer named the Trooper. What about Gloryhammer? Anything in the works for a BBQ sauce or vaginal lube called Glorysauce or anything? Ok this me asking you for a favor, I’m running a Dungeons and Dragons campaign…not sure if you play but if you do…can you give me some quick stats on an undead unicorn. I want to kill off my players and at the same time humiliate them. I will claim Christopher Bowes has killed you! Ok. I know Jaraad from Der Metal Krieger. I know you two are buds. But I need to feel good about myself, tell me how awesome I am and how he should be more like me. I want to rub this in his FACE! Chris: Jaraad! You should be more like TJ!!! Ok Chris I think my bout with insanity is about over. Anything you want to add before we go? Words of epic wisdom to impart? Chris: Go buy our Album! It’s out now in America and also in Finland! And come see us live if at all possible and let Gloryhammer rock you!